WiFi uses low power radio signals to connect a laptop, tablet computer, smartphone or other device to a computer network. Government regulations limit the strength of the radio signal produced by a WiFi router (sometimes called an access point), and typically the maximum transmitting power is one tenth of a watt. This is similar to a cellphone operating at or close to its maximum (average) power, and less than a hand-held radio. The average transmitting power, however, is much lower than this because the router only transmits when sending data to a device connected to it. The rest of the time it is silent, apart from brief signals to alert nearby devices that it is available. These measurements were made on a home router (Linkysys WRTG54). In order to ensure that the router was active, a downloading speed test was run on a device connected to the router while a measurement was made. 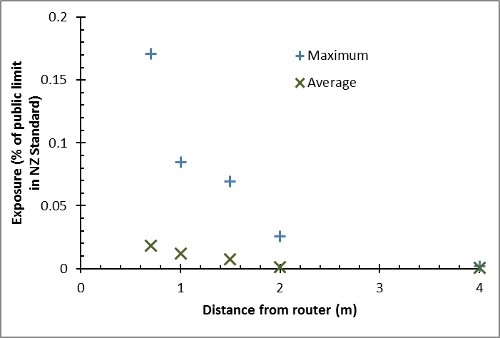 Measurements were made 0.7, 1, 1.5 and 2 metres from the router, and about 4 metres away in an adjacent room. The door between the two rooms was left open, but the router was not quite visible from the point where the measurements were made. The measurement probe was at the same height as the router. At each point, both the maximum exposure and the exposure averaged over half a second were measured. The results are plotted on the left. Blue crosses show the maximum exposure at a point, and green crosses the average exposure. The exposure is shown as a percentage of the limit in the New Zealand exposure Standard. For example, one metre from the router, the maximum exposure was about 0.085% (ie a little under one one-thousandth) of the limit, and the average exposure was about 0.02% of the limit. These results are typical of those found with other WiFi systems.